Mumbai: Singapore government-owned sovereign fund Temasek Holdings Pvt. Ltd plans to acquire a significant minority stake in digital payments platform Pine Labs for $350-400 million, two people aware of the development said. Temasek is likely to buy the stake from Sequoia Capital and promoters, in a deal that will value Pine Labs at $1 billion, one of the two persons cited above. Pine Labs, which provides digital point of sale (PoS) solutions to merchants, had raised $82 million in an investment round led by Actis Capital along with Altimeter Capital in March, valuing the company at $800 million. Pine Labs’ existing venture capital investor Sequoia Capital first invested in the payments company in 2009 and remains its largest shareholder. Pine Labs offers cloud-based PoS payments solutions, allowing merchants to accept credit or debit card payments, e-wallets, QR code payment solutions and unified payments interface (UPI)-based solutions. Founded in 1998 by Rahul Garg, the Noida-based company processes 450 million transactions worth over $15 billion on an annualized basis. In financial services, Temasek’s India investments include online payment gateway solution provider BillDesk and online insurance selling platform Policy Bazaar. Temasek, which owns a $197 billion worth portfolio as on 31 March 2017, has invested more than $10 billion in India since it set up an Indian office in 2004. Vicky Bindra, CEO at Pine Labs and a Sequoia Capital spokesperson declined to comment, while Temasek spokesperson also declined to comment. As part of an international expansion, Bindra, former global head for product and solutions at payments major Visa, was named Pine Labs CEO last month. Bindra has also worked with Mastercard and GE Capital. Pine Labs claims to have a 10% share in PoS market in India. “We have a presence of about 300,000 PoS in the market, which is about 10% of the footprint in the country. 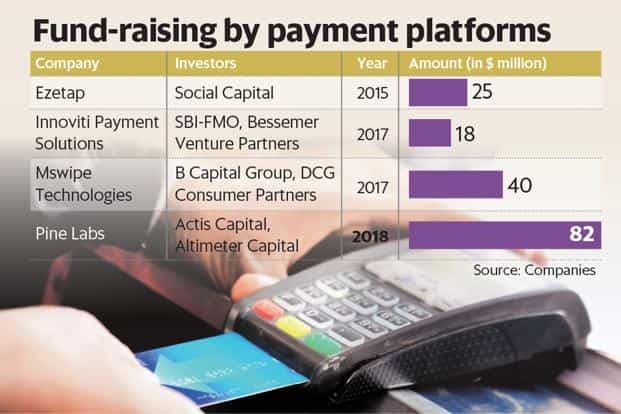 We have about 15% of the card volume flowing through our network," Lokvir Kapoor, former chief executive officer at Pine Labs had said during last round of funding in March this year. After its entry into Malaysia, Pine Labs plans to expand its footprint in the United Arab Emirates (UAE), Qatar, Saudi Arabia, Indonesia, Philippines, Thailand and Vietnam. In the next three-to-four years, Pine Labs expects to grow from the current level of 300,000 to 1 million terminals. In India, Pine Labs competes with MSwipe Technologies Pvt. Ltd, Innoviti Payment Solution Pvt. Ltd, Ezetap and Atom Technologies. As part of expanding the network, all the major payment solution providers have raised 2-3 rounds of private equity funding till date. Innoviti Payment Solutions, a payments company backed by Infosys Ltd co-founder N.R. Narayana Murthy’s Catamaran Ventures, raised ₹ 20 crore from SBI-FMO and Bessemer Venture Partners in July last year. Innoviti had raised ₹ 30 crore from Catamaran Ventures and New India Investment Corporation, Canada in 2015. Enterprise payments solutions firm Ezetap raised $16 million in a growth round from JS Capital Management Llc, a US-based venture capital fund. In August 2015, investors led by Social Capital, invested $25-million series C fund-raise in Ezetap. In December last year, MSwipe announced the closing of its Series D round of above $40 million (Rs258 crore) led by Facebook co-founder Eduardo Saverin’s investment fund B Capital Group ($10 million) along with existing investor DCG Consumer Partners.